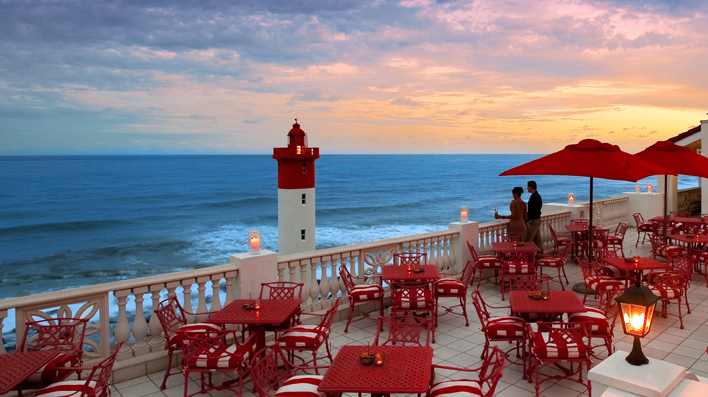 The Oyster Box (www.oysterbox.com) is a haven of style and luxury for the discerning traveller. And if cocktails are not for you, how about a brandy tasting this winter in anticipation of Durban’s premier race-day, the annual Vodacom Durban July (www.vodacomdurbanjuly.co.za) horserace at Greyville Racecourse. Enjoy a Pre-Durban July this Friday 5 July from 5-7pm with a brandy tasting in the local’s favourite watering-hole, the Chukka Bar. After the brandy tasting head across to The Pearl Room for a traditional South African meal with a glamorous twist, a gourmet curried bunny chow with fresh home-made condiments and a scrumptious dessert to top it all off! It’s comedy and curry at The Oyster Box this Friday night with Durban’s funniest comedians from 5-7pm. Cost: R350. The Square Boutique Hotel & Spa (ceres@threecities.co.za) up on the hill in Umhlanga Ridge near Gateway Shopping Centre (www.gatewayworld.co.za) has a more intimate cocktail pool bar perfect on a still tropical night. Ask for their famed Strawberry daiquiris! They serve yummy bar snacks and you can mingle with the locals at this elegant boutique hotel owned by The Three Cities Group (www.threecities.co.za) The view is stunning. Expect 180 degree ocean views most dramatic at night with ships twinkling like stars on the horizon. If you’re on holiday staying at one of our Beach Houses in Umhlanga (www.beachhouseletting.com) you are truly spoilt being surrounded by cocktail bars with pools and dramatic ocean views. Where else can you holiday in a tropical city with beautiful balmy sunshine all year round.